I’ve noticed recently that I have an obsession with side dishes. Every dish that’s catching my eye in magazines, other blogs and Pinterest are salads or dishes overflowing with vegetables and interesting flavors. Most of what I make for myself are just giant side dishes with small touches of protein. Now that cooler weather is here, I default to thinking about all of the amazing vegetables I can roast up and easily enjoy. Two of my favorite roasting vegetables have made their return to my farmer’s market: brussels sprouts and sweet potatoes. Nothing says fall and winter holidays and good food like those two. Noticing my recent taking to side dish recipes, I decide to combine my two favorite vegetables into one side that’s perfect for the season and for any entertaining you may have coming up. 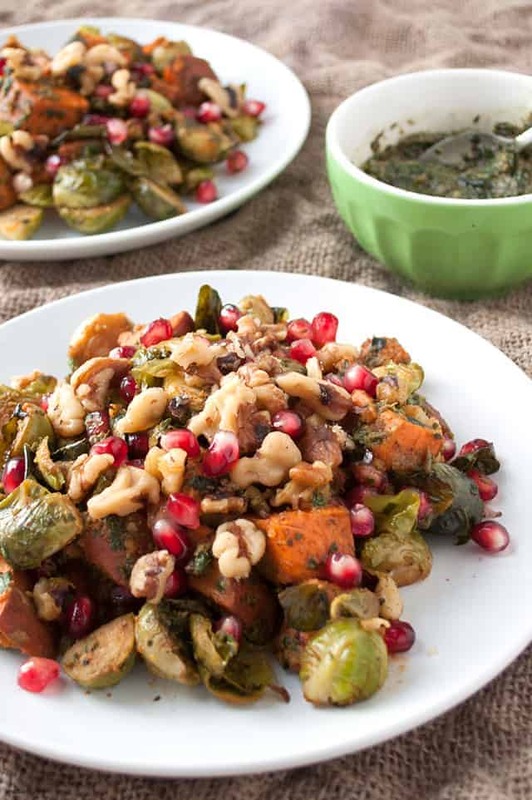 I’ve added some other classically fall ingredients as well, like walnuts and pomegranate seeds (or arils, the actual name for the seed and juice capsule.) To bring all of the flavors together, I added a few tablespoons of the Chard and Walnut Pesto from Food Gift Love that I made recently. Any pesto, vegan or regular, would work fine. Folding pesto into a side dish is good break from the normal addition to pasta that we usually default to. If you want to add more vegetables to the party, you could add roasted carrots or parsnips as well. If you want to turn this into a main dish, simply add a can (or two cups) of your favorite cooked bean, tempeh cut into strips or crumbled up, or a serving or two (depending on how much of the side you make) of chicken, fish, or any other meat protein you like. However you enjoy this dish, I hope it gets you dreaming of fall and winter side dishes like I am. 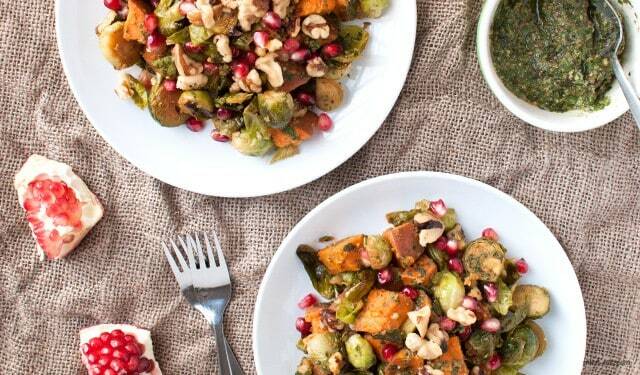 Arrange sprouts and cubed sweet potato on a foil-lined baking sheet. Lightly drizzle olive oil over the vegetables and evenly sprinkle with salt, pepper, and garlic powder. Roast for 20-25 minutes, until sweet potato is just before extremely fork tender. Once done, transfer vegetables to a large mixing bowl. Add in pesto, walnuts, arils, and adjust seasonings and add more pesto as needed.